30.5.  State funding helps keep tuitions low at public colleges. As a result, more Texans can afford college.  For the years 2000 and 2001, the Texas. 2  State funding helps keep tuitions low at public colleges. As a result, more Texans can afford college. 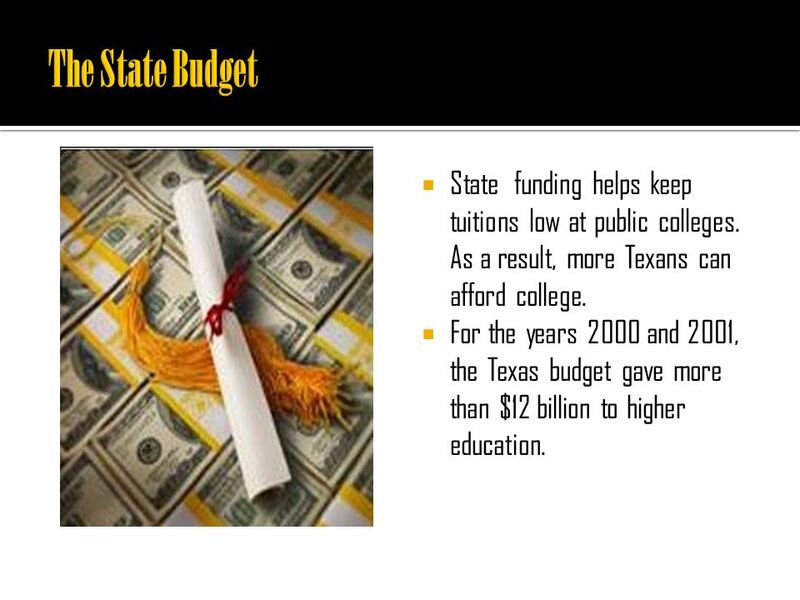  For the years 2000 and 2001, the Texas budget gave more than $12 billion to higher education. 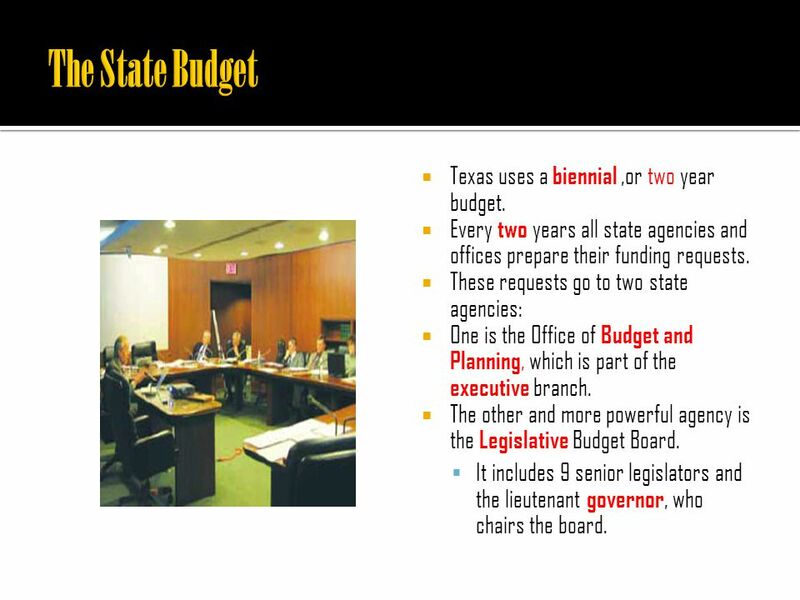 4  Texas uses a biennial,or two year budget.  Every two years all state agencies and offices prepare their funding requests.  These requests go to two state agencies:  One is the Office of Budget and Planning, which is part of the executive branch.  The other and more powerful agency is the Legislative Budget Board.  It includes 9 senior legislators and the lieutenant governor, who chairs the board. 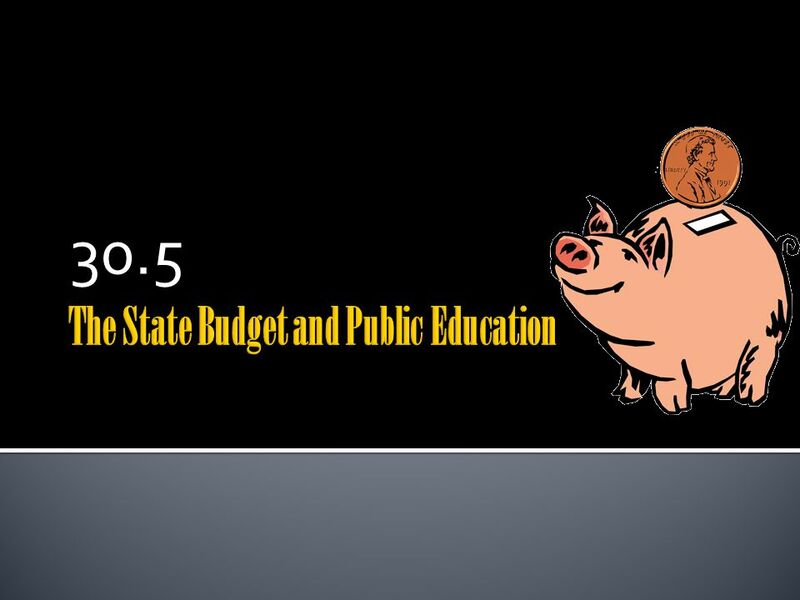 5  The two agencies analyze funding requests and send a budget proposal to the Senate Finance Committee and to the House Appropriations Committee. 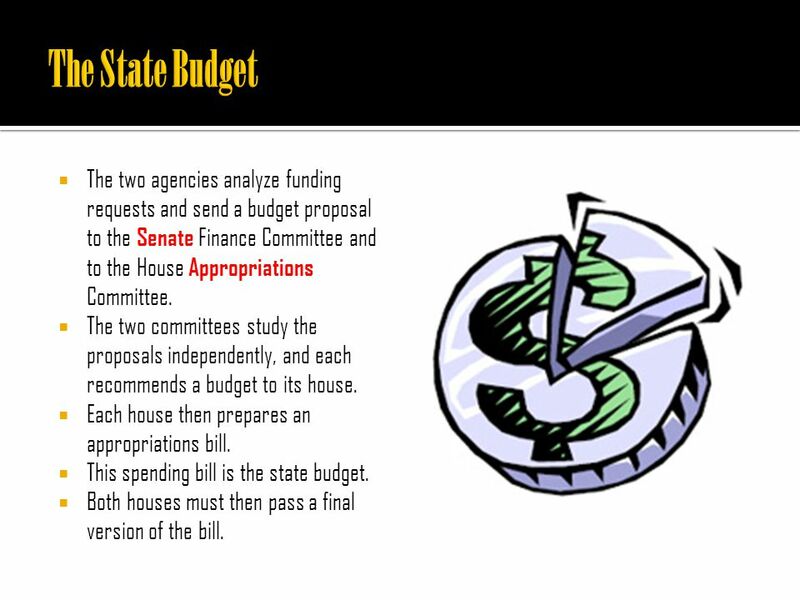  The two committees study the proposals independently, and each recommends a budget to its house.  Each house then prepares an appropriations bill.  This spending bill is the state budget.  Both houses must then pass a final version of the bill. 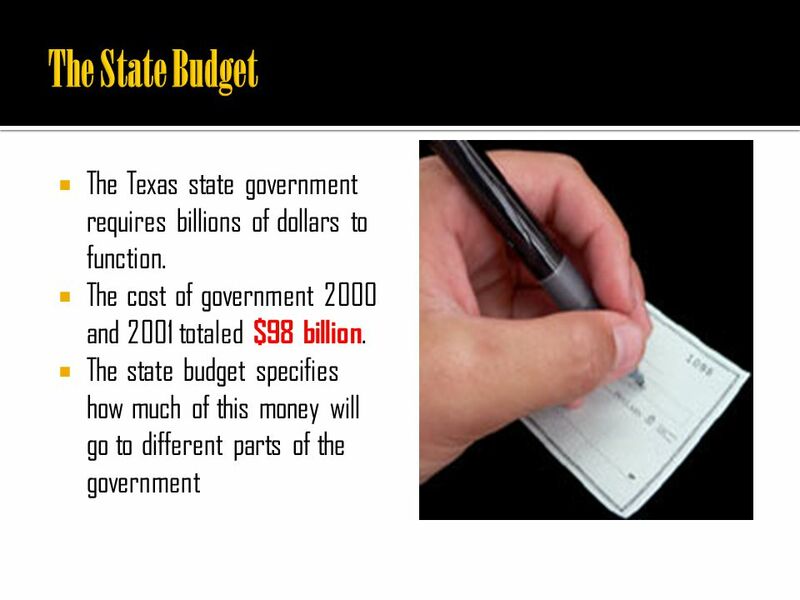 7  The Texas state government obtains the billions of dollars it needs from several sources.  In 2000 the sales tax made up about 55% of the state’s tax revenue.  The sales tax gives the state a small percentage of the price of many goods and services.  This tax is taken at the time of sale. 8  Three other important contributed about 15% of the state’s income. 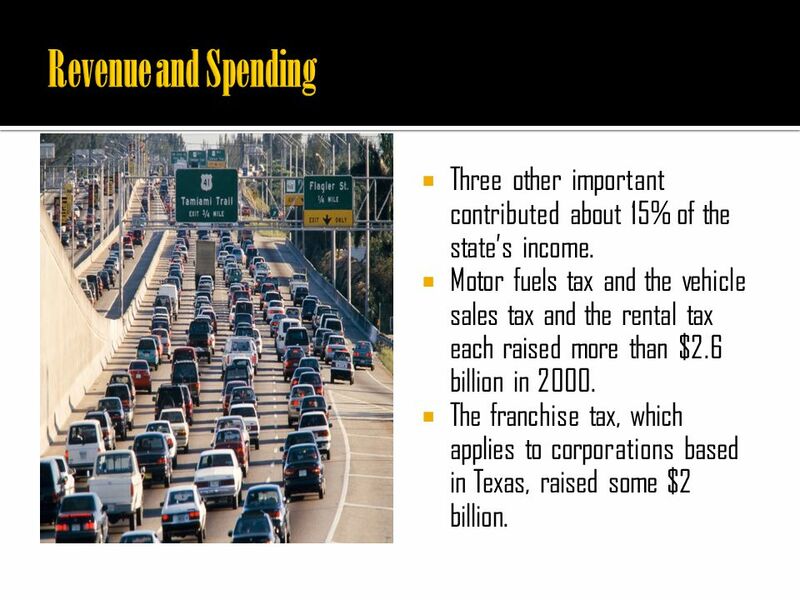  Motor fuels tax and the vehicle sales tax and the rental tax each raised more than $2.6 billion in 2000.  The franchise tax, which applies to corporations based in Texas, raised some $2 billion. 9  Much of the rest of the state’s income comes from federal grants. 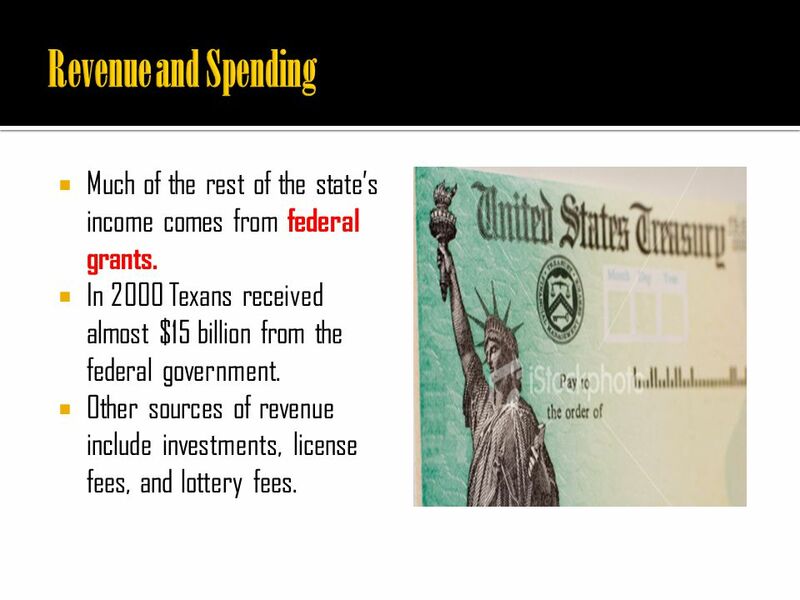  In 2000 Texans received almost $15 billion from the federal government.  Other sources of revenue include investments, license fees, and lottery fees. 10  State funds are used to build highways, pay state employees, and provide many other public services. 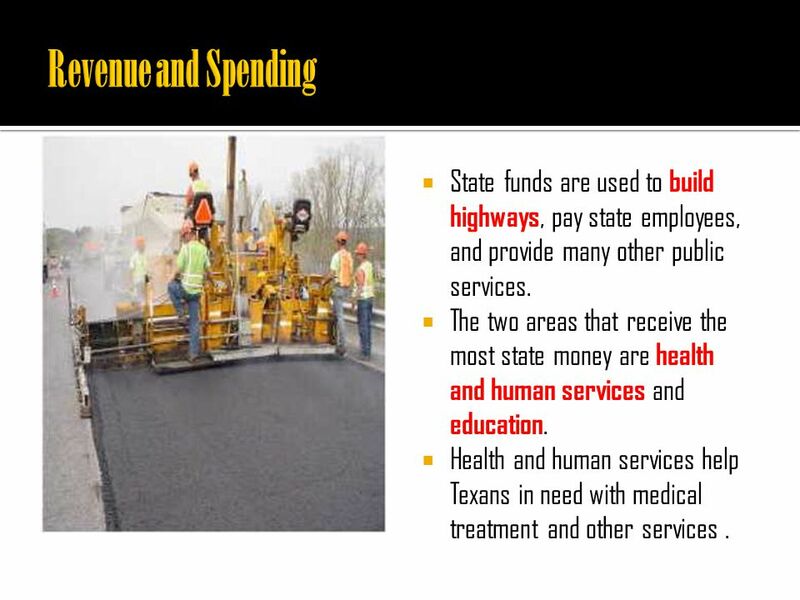  The two areas that receive the most state money are health and human services and education.  Health and human services help Texans in need with medical treatment and other services. 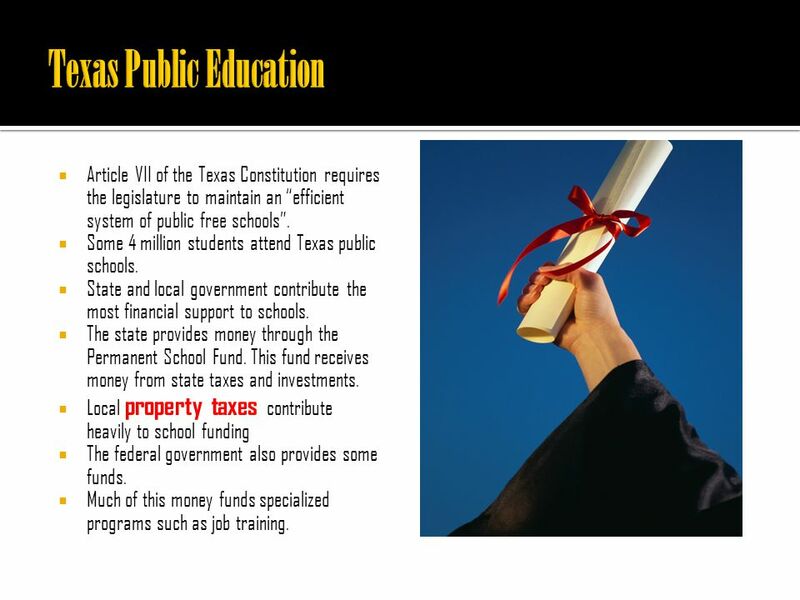 11  Article VII of the Texas Constitution requires the legislature to maintain an “efficient system of public free schools”.  Some 4 million students attend Texas public schools.  State and local government contribute the most financial support to schools.  The state provides money through the Permanent School Fund. This fund receives money from state taxes and investments.  Local property taxes contribute heavily to school funding  The federal government also provides some funds.  Much of this money funds specialized programs such as job training. 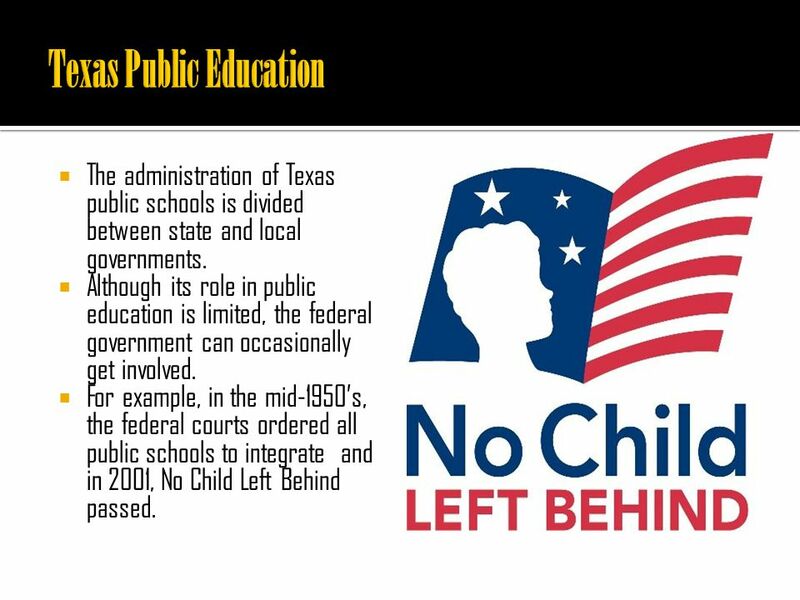 12  The administration of Texas public schools is divided between state and local governments.  Although its role in public education is limited, the federal government can occasionally get involved.  For example, in the mid-1950’s, the federal courts ordered all public schools to integrate and in 2001, No Child Left Behind passed. 13  At the state level, the Texas legislature passes the laws governing public schools including the subjects they teach.  Two state agencies assist the legislature with these matters. 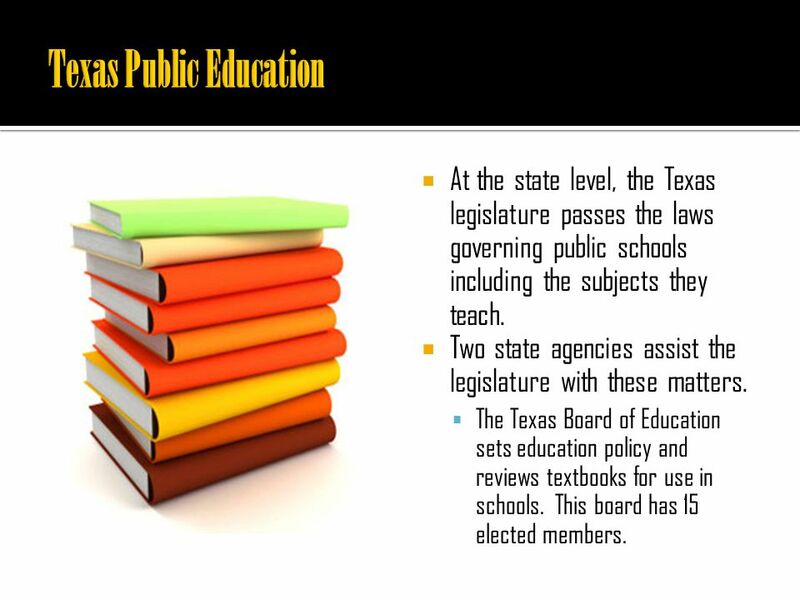  The Texas Board of Education sets education policy and reviews textbooks for use in schools. This board has 15 elected members. 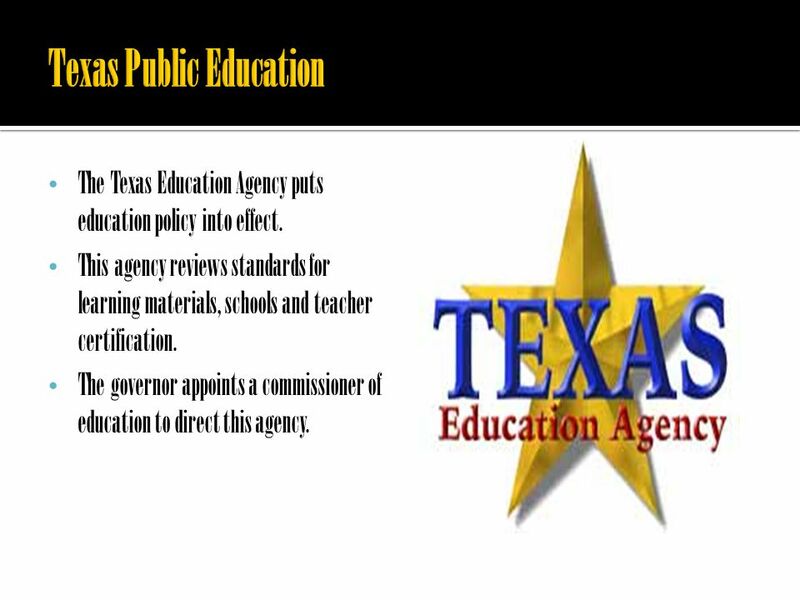 14 The Texas Education Agency puts education policy into effect. This agency reviews standards for learning materials, schools and teacher certification. The governor appoints a commissioner of education to direct this agency. 15  More than 1,000 independent school districts run schools at the local level.  Boards of trustees or school boards govern those districts.  School boards arrange for school construction, select textbooks, and set property tax rates. 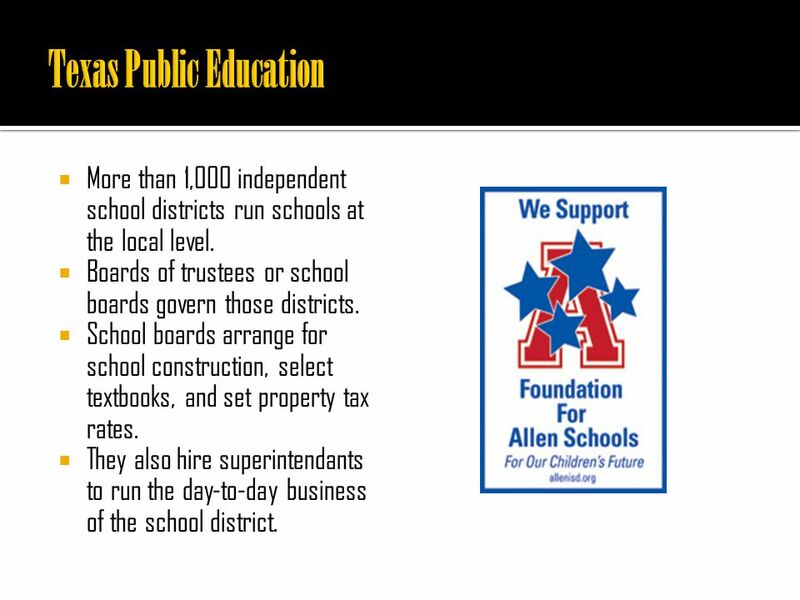  They also hire superintendants to run the day-to-day business of the school district. Download ppt "30.5.  State funding helps keep tuitions low at public colleges. As a result, more Texans can afford college.  For the years 2000 and 2001, the Texas." Senator Dean Cameron Chair Senate Finance Committee Co-Chair JFAC. Florida Atlantic University Overview of Operating Budget Process Presentation to the Florida Atlantic University Foundation, Inc. Board of Directors February. People Lawrence “Sul” Ross Gen. in Confederate Army 19 th Governor of Texas President of Texas A&M University. 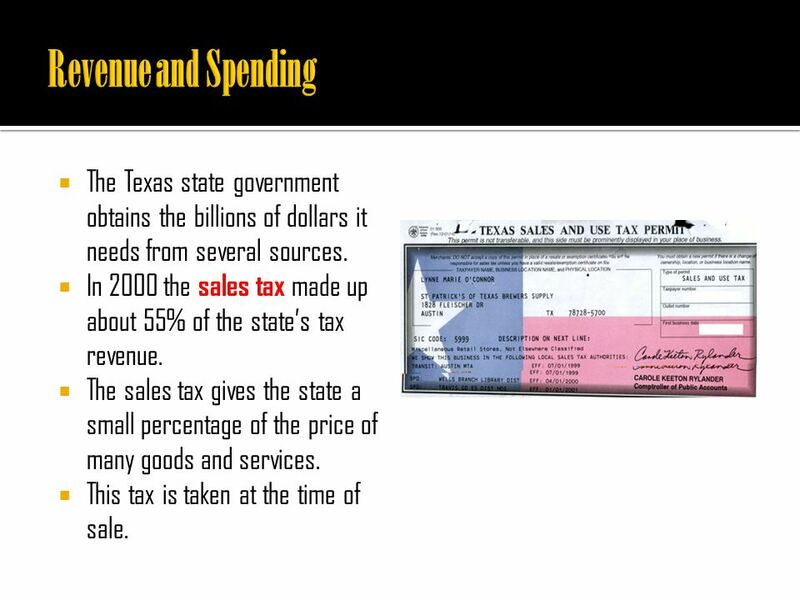 Sources of State Revenue SS8E4 The student will identify revenue sources for and services provided by state and local governments. Trace sources of state. Chapter 11 Public Finance in Texas. 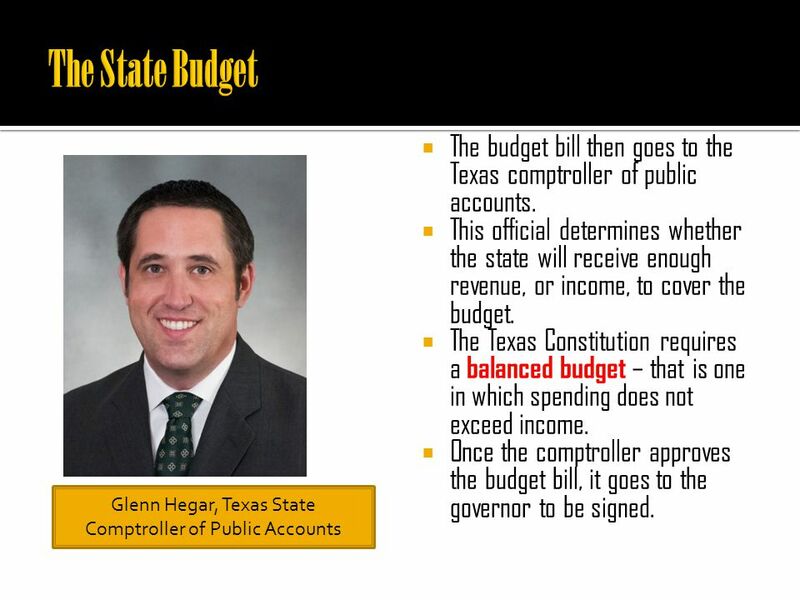 The Budget The state constitution requires that the legislature operate within a balanced budget. The Texas budget. The Executive Branch SS8CG3 The students will analyze the role of the executive branch in Georgia state government Explain the qualifications, term, election. Bell Ringer What were positive aspects of the Mock Supreme Court activity and how can the activity be improved? List at least one for each! I.Virginia State Government A.What are the purposes of the Virginia state government? promote public health, safety, and welfare administer federal programs. Texas Constitution and Limited Government. State of Texas Constitution of 1876 Republicanism – a belief that government should be based on the consent.